SEOUL (South Korea) — Opening round groups for the first-ever Premier12™ global baseball tournament, which unites the twelve highest-ranked countries from the WBSC Baseball World Rankings, were among a series of major announcements at a press conference Wednesday led by WBSC President Riccardo Fraccari in the South Korean capital. The top four nations from each group surviving the Opening Round clash will advance to the quarterfinal knockout stage before the Premier12 shifts from Taiwan to Japan’s iconic Tokyo Dome for the semi-finals and finals. 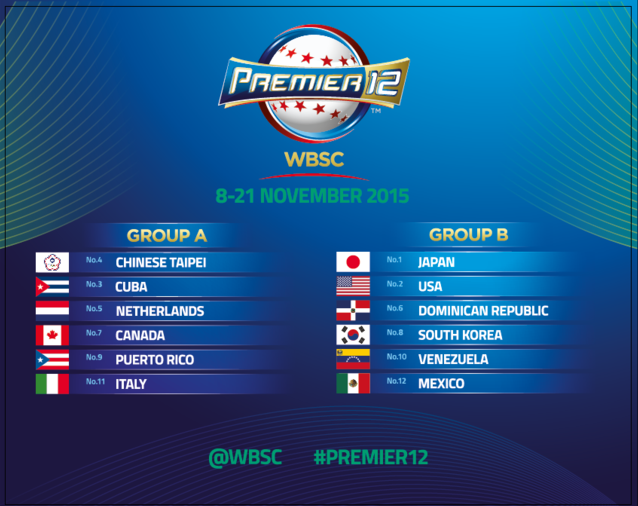 In Group A, it will be Chinese Taipei and Netherlands, the 2011 Baseball World Cup champions, at Taichung’s Intercontinental Stadium on 9 November. Helping to showcase the sport’s popularity and existing world-class venues in Japan as baseball/softball vie for a spot at the 2020 Olympic Games, there was a special announcement to reveal that the 40,000-seat Sapporo Dome has been added to the line-up and would host the Group B opener, which will feature top-ranked Japan and South Korea on 8 November. Samurai Japan National Team manager Hiroki Kokubo has underlined Japan’s intention to capture the initial Premier12 trophy and will look to assemble a Japanese “Dream Team” that will make the entire country proud. The Korea Baseball Organization (KBO) League — South Korea’s top sports league — was present for announcements Wednesday and “welcomed the challenge” of the opening battle against rival Japan, declaring the league’s support of the South Korean National Team in the Premier12. The inaugural Premier12 is being co-hosted by Nippon Professional Baseball (NPB) — the second highest-attended major sports league in the world in 2014 (approx. 23 million) — and the Chinese Taipei Baseball Association.